Filing a Hurricane Harvey Claim? Here are 8 Steps that will help you! Need Hurricane Harvey claim assitance? Hurricane Harvey has devastated many Texans and business owners, causing a projected $5 billion to $10 billion in property damage. If you find yourself among the many who are suffering from property damages, then you’ll need to file an insurance claim. 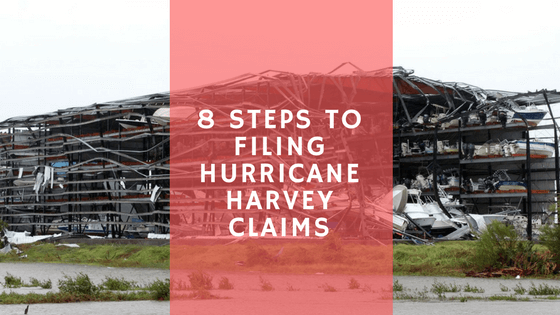 This can be overwhelming, but it is easy to get Hurricane Harvey property claim help by following these eight insurance claim filing steps! Some insurance companies might limit or not offer coverage for damages from hurricanes in their policies, such as mold and debris removal, so it is important to contact your insurance provider before starting a claim. Verifying exclusions or limits will help you pinpoint the services you can be approved for as quickly as possible. Immediately after you contact your insurance company, you should contact an experienced certified public adjuster. Need help finding a public adjuster? NAPIA is the National organization for public insurance adjusters. You can search for the best certified public adjusters from their database. When you have a tax problem, you hire a CPA. When you have a legal problem, you hire a lawyer. Who do you hire when you have an insurance problem/disaster? You hire a certified PUBLIC ADJUSTER. Hiring a Public Adjuster can remove the complexity of filing a property claim, expedite your restoration and increase your financial return on your claim. Strategic Claim Consultants is a premier certified public adjuster who has been featured on NBC, Fox and other media outlets for the work they have done with Hurricane Harvey. They have assisted policyholders in over 25 Natural Disasters. If you want or need assistance filing a claim. You request help on our Hurricane Harvey Claim Assistance page. Can you do this yourself?…yes, if you have all of the knowledge and experience navigating the insurance claim process and how to get the most money from insurance companies. For most, this is not the case. If you still want to tackle it on your own, here are some steps you need to make sure you do while filing a claim. Before you can get Hurricane Harvey claim assistance, you need to pay your policy deductibles. Deductibles can vary depending on factors like the storm’s timeline and event classification. Your insurance provider can help you determine your appropriate deductible estimates. To determine an accurate coverage amount, your insurance company will want proof of your losses. Use this to your advantage by creating a list of damaged items, taking pictures of evidence, and not discarding any affected items unless your insurance company tells you to do so. Monitor the progression of your insurance claim by taking notes on your claim number—which is important to providers for looking up your file—and following suggestions made by your insurer. If available, sign up for text alerts so you can stay on top of important notifications. Business and residential claim assistance differ from one another, which can easily make the claim process more confusing than it already is. Hire a property insurance professional and a public adjuster, so they can manage the process and speed it up for you. Fraudulent contractors will take advantage of your misfortune. Avoid them by verifying licenses and seeing if they are listed with your insurer. Stay away from contractors who want payment before work completion. You should request and check references, too. Insurance claims and contracting will require property owners to mitigate further damages. You can do this by boarding up broken windows and doors, removing damaged drywall and insulation, turning off main water pipes, and taking preventative measures to reduce mold growth. Finally, if permitted by your policy, consider hiring your own experts like restoration contractors, engineers, public adjusters, and more. They can handle all the tedious work for you. That way, the insurance claim can be handled efficiently and accurately while you are busy overseeing your other responsibilities. If this seems overwhelming, it should. This is a tough task for anyone going through recovering from a disaster. That is why we are here…reducing your stress, increasing your claim and expediting your restoration. If you want residential or commercial claim assistance for Hurricane Harvey, you need to begin the process immediately. Do you need help to get started? Contact Strategic Claim Consultants today! We have also created several insurance claim publications just for you!